Chris Swire, founder of Collier's Powerful Cheddar was born in South Wales and grew up in a family of miner, or colliers, as they were often referred. Cheese was a welcomed midday meal that aided and sustained them throughout their day underground. Colliers Powerful Cheddar was develop with this in mind. 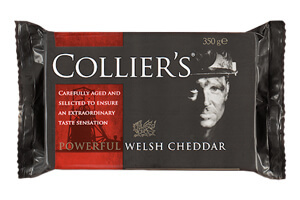 Collier’s Powerful Welsh Cheddar is made in one creamery in North Wales, from a single recipe and is a tribute that mining tradition. This Welsh Cheddar has characteristics of a coal miner; this powerful cheese has an extraordinary taste sensation; a fine balance of savory and sweet, a open, slightly crumbly texture, yet smooth and creamy in the mouth. Unusually, it contains crunchy pieces that develop during maturation. This classic cheddar can be paired with your favorite beer or ale and of course, always goes well with a crisp glass of chardonnay. Try it on a cracker with some fig preserve, fantastic combination. Ingredients:pasteurized cow's milk, salt, starter cultures, rennet.